A voracious bookworm, language lover, science nerd and health nut with a decade of academic study under her belt, Miranda’s mis-mash of passions and experiences serve her well as Nutrishatives lead author. Miranda earned her undergraduate work in human physiology, chemistry and (because, why not?) French at Alma College in rural Michigan. 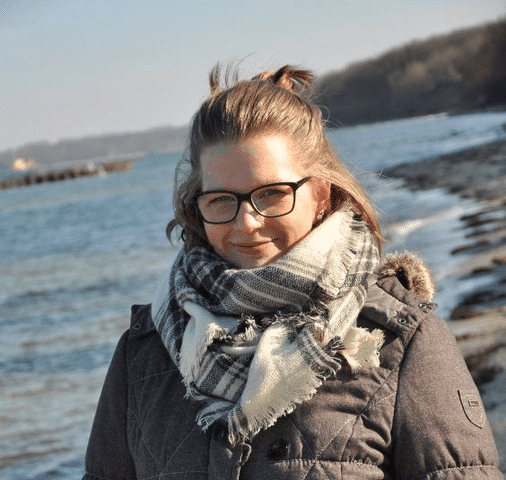 After graduating, she headed to Europe and settled in northern Germany (you know, a place where French comes in really handy) and earned her German graduate degree in human nutrition from Christian-Albrechts-Universität. While her studies fueled her appreciation and admiration of the human body, they wore away at her confidence in post hoc, symptom-focused medicine. She became a vocal, active advocate for holistic, lifestyle and preventative medicine, volunteering for organizations like NutritionFacts.org. After graduating, she decided to dedicate herself to promoting science-based lifestyle medicine full-time. With the realization she could easily combine this goal with her lifelong love of written language, she made her way into science journalism, and onto our team! Miranda currently lives in Kiel, Germany, with her husband, their obscene number of coffee cups, and their balcony seagull*, Herbert. In her spare time, she loves doing HIIT, knitting, and nerding out with a good book or a sci-fi/fantasy/superhero movie. *For those unfamiliar with the term (that Miranda made up), a balcony seagull is a seagull that comes and eats your balcony garden vegetables and compost trash. They are essentially stray cats for ocean-proximate apartment dwellers. You don’t want one. They make a mess.